Fall is for apple cider, pumpkin carving, and ... getting a new health insurance policy. Now more than ever, we can't forget the gains made by the Affordable Care Act. There's more work to be done to reach the uninsured with affordable and quality coverage and care. Put on your sweater and let's go! People age 19 to 64 have their chance to sign up for insurance on the health insurance marketplace now through January 31st. The Get Covered Connector, created in partnership by Get Covered Illinois and Enroll America, allows consumers to register online for appointments to get help enrolling into health insurance coverage. Now that open enrollment has come and gone a few times, we know that it isn't just for people who do not have insurance. Prices, approved providers, healthcare facilities, and the healthcare needs of consumers change. So, open enrollment is a time to revisit coverage and see if the same health plan makes sense, or if there is a better bargain and better coverage available. You can simply zoom in on an address, or fill in some form items, like household income or age group, to target specific populations of uninsured. The data comes up when you zoom in. 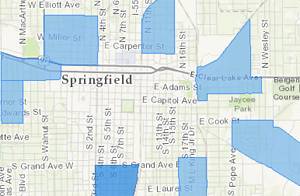 Darker areas indicate a higher proportion of uninsured residents. The interactive tool, provided by the HRSA Data Warehouse, presents data at the Block Group level. Block Groups are units of geography used by the Census Bureau, which typically have a population of 600 to 3,000. As a result of the ACA, insurance companies don't deny people with pre-existing conditions anymore, young people can stay on a parent's plan until age 26, and preventive care is available with no cost to the consumer. The uninsured rate is down, but that doesn't mean that improvements to the health insurance system and the operation of the ACA are over. It is time to turn our conversations away from whether the ACA should or shouldn't exist, because it is here to stay. Now is the time to tackle the improvements that need to be made to the law. The now-usual news of increasing rates is heard loud and clear. Consumers now more than ever need to make the choice not to stick with the "same as usual" health plan. 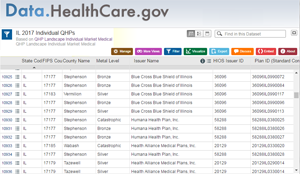 To help people compare exchange options, HealthCare.gov has released a list of the 2017 qualified health plans. We have filtered the dataset for Illinois. It can be sorted by county or any other column. For many, a change of plan will be inevitable. Notable absentees from offered plans include Harken Health and Aetna. With the closure of Land of Lincoln health, those that did not take advantage of the special enrollment period will need to make a choice of a new plan this open enrollment period. Shop around, compare options, maximize financial assistance, which is available to most people by taking advantage of available in-person help. A proliferation of imitators is hampering ACA sign-up efforts. Remember, you can't get financial help for health insurance outside of HealthCare.gov. IlliniCare Health earned a top rating for its Medicaid plan in Illinois from The National Committee for Quality Assurance, a 3.5 star rating - the highest score among Medicaid health plans in Illinois. Now that the state has submitted the Behavioral Health Transformation waiver, a federal comment period is open until November 19. Submit your comments with CMS. Health Alliance Connect is ending participation as a Medicaid managed care health plan in the regions of Rockford, Quad Cities and Central Illinois. Please forward this newsletter to friends or colleagues who are interested in how the ACA and other developments are impacting health care in Illinois with. If you have questions or suggestions, email us at info@illinoishealthmatters.org.